G.I. 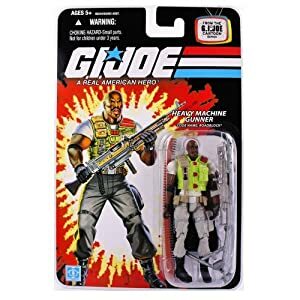 Joe: A Real American Hero was a comic book and cartoon series based off of Hasbro’s 1980’s military action figure toy line. While both series covered the same characters and concepts, they had vastly different continuities. The cartoon’s stories were far more fantastical (and often silly) while the comic was far more realistic and gritty. Our write-ups specifically cover the first 56 issues of the 1982-1994 Marvel comics series which took place in its own universe. It thus excludes any events found in any other comics (IDW, Image, etc.) or television/movie series. 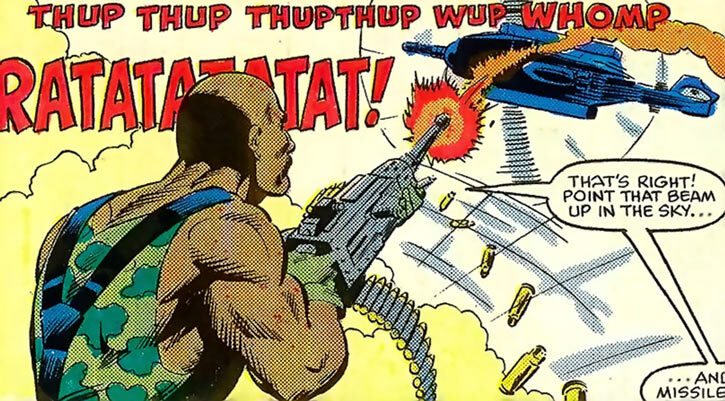 Roadblock was THE Heavy Machine Gunner and team strong man in both the cartoon and comics. 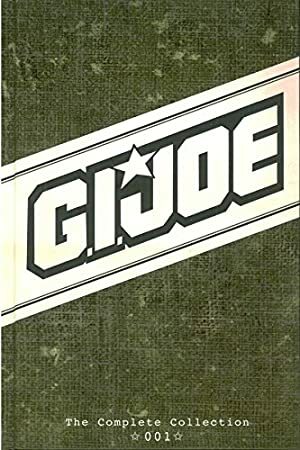 In the comics, he was far more intellectual and he appeared in more issues of the comics than any other Joe (outside of Snake Eyes and/or Hawk). Real Name: Marvin F. Hinton. Height: 6’10” Weight: 270 lbs. Eyes: Brown Hair: Black (Bald). Roadblock is a highly trained, seasoned combat veteran of considerable skill. As a member of G.I. Joe, he gained extensive experience in various disciplines (including mountaineering and parachuting) and has participated in numerous clandestine operations. Even for a soldier, he is unnaturally robust and strong. In the past he has lifted a piece of armoured plating onto his shoulders while three full grown men clung to the other side. This strength serves him well in his role of heavy machine gunner for the G.I. Joe team. He routinely wields and fires a M2HB Browning heavy machine-gun from his hip in combat. For clarity, when unloaded, a M2HB Browning weighs approximately 85lbs. Each 100-round ammunition belt weighs approximately 23 pounds and will grant the wielder about 10 seconds of fire. It is designed to be fired from a mount (either a tripod or on a vehicular mount), and can be used to disable unarmoured vehicles or to shoot down low flying aircraft. Roadblock also carries several fragmentation grenades and a combat knife on his person when expecting combat. Marvin Hinton was a soft spoken young man who grew up in Biloxi, Mississippi. He was a gentle soul, and an active participant in the community that surrounded him. He was a member of the church choir as well as the boy scouts. From a young age, he displayed a passion for food and dreamed of becoming a gourmet chef. This desire only intensified as he grew older (and larger… much larger). He began to work as a bouncer in a local bar in order to earn enough money to attend the Escoffier School of Culinary Arts . One night while he was working, Marvin was approached by an army recruiter who convinced him that he could gain the knowledge he sought while serving his country. Marvin joined the service, but quickly found that their menus and preparation techniques “appalling.” Put off by this, he made a rash decision and transferred to the infantry. There he discovered his second calling in life. While he was an excellent cook, he was an even better soldier. His skill and raw physical strength quickly distinguished him from his fellow soldiers. He was eventually handpicked to join the G.I. Joe mobile strikeforce. He made a huge splash on his very first day with the team; the day of General Flagg’s funeral. Every Joe that could stand was in attendance for the funeral of their fallen commander when a Cobra Rattler (a fighter jet) appeared low in the sky and on an attack vector for the mourners. Even as the plane opened fire on the mourning Joes, Marvin (now known as Roadblock) appeared out of seeming thin air and shot the warplane out of the sky using a weapon most men couldn’t carry, much less wield in combat. He further distinguished himself with his fellow Joes when on his very first assignment. 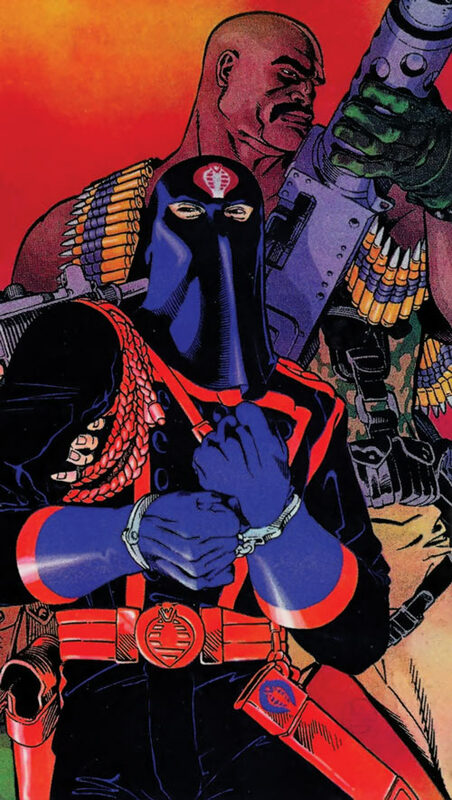 He, along with Clutch, captured Cobra Commander himself. This achievement was but one of many that followed Roadblock over the next several years. He participated and played a major role in several clandestine missions over that time; both on American soil and overseas. 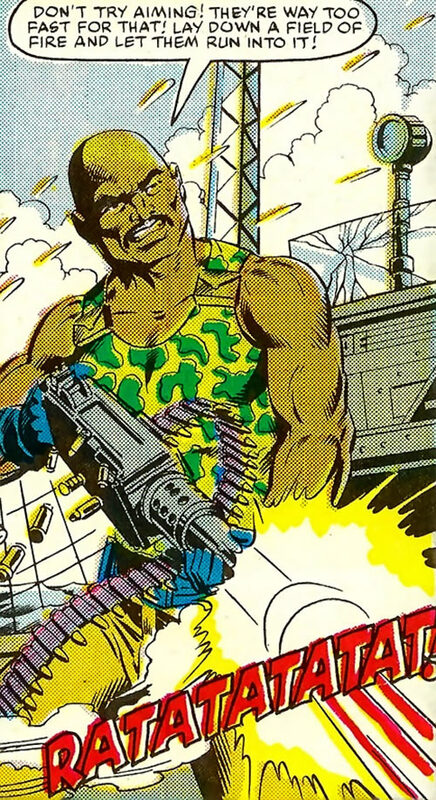 Roadblock is most often depicted as a big African-American male. While he has a bulky physique, he isn’t musclebound. He is depicted with the ability to move with a grace uncommon amongst men of his stature. 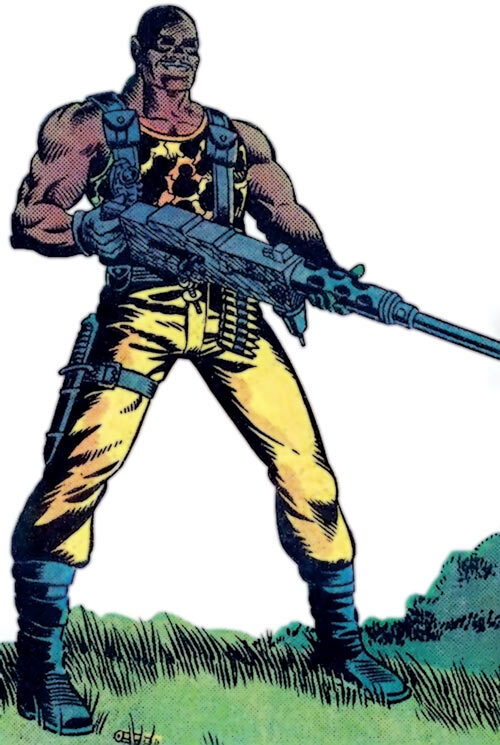 Like most African-American males, Roadblock has dark brown eyes and black hair. His scalp is clean shaven, while a thin moustache and goatee cover the lower half of his face. 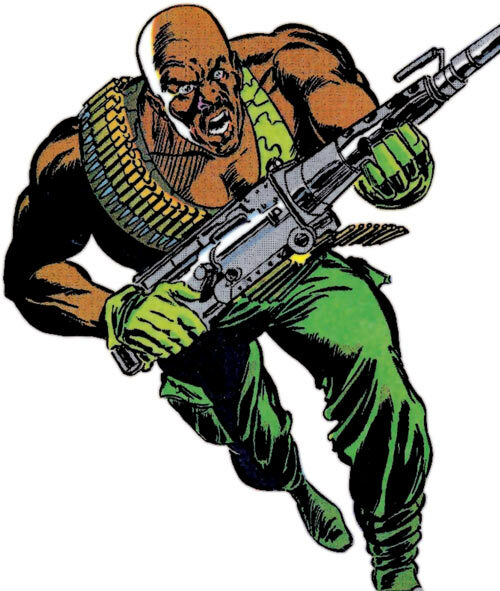 Roadblock’s first uniform consisted of a light and dark green camouflage vest with black belt and straps, rust orange Khaki type pants, thick black combat boots and a pair of green gloves. His arms were bare (most likely for comfort). Roadblock is a confident and charismatic man. He is used to people looking at him (due to his enormous size) and tends to try and put people at ease with his charm. He comes across as laid back, humble and easy to talk to, even during combat. He is apt to make cheesy jokes while laying down streams of deadly fire from his massive firearm during combat. This isn’t to say he doesn’t get angry. He does and when he shows it most normal men are instantly intimidated. Above all else, Roadblock is a patriot and will go to great lengths to protect his homeland and its ideals. He once threatened a man who was about to set an American flag on fire with his .50 caliber Browning. Though he later on stated that he was only bluffing, most of the onlookers (including his teammates) didn’t believe him. Roadblock, and every other member of G.I. 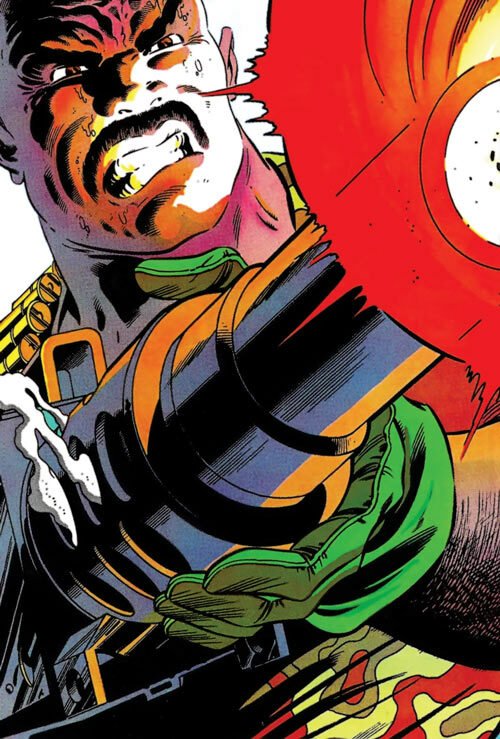 Joe can be inserted wholesale into the DC Universe without changing their origins. Instead of dealing with a criminal organization named Cobra, it would be simple for them to be combating Kobra’s vast terrorist organization. The Elite Agents of S.H.I.E.L.D. are a clear example of such an unit. Expertise (Food Critique, Military Equipment and Protocols, Mountaineering, Parachuting), Rank (E-4, Corporal), Shtick (Mighty Thews (Heavy Weapons)). US Armed Forces (Low), GI Joes (High). Creepy Appearance (Height and Bulk), MIA toward Patriotism, Secret Identity. HMG (M2HB Browning) [BODY 06, Projectile weapons: 09, Ammo: 10, R#02, Recommended STR 06 (none when using a tripod or vehicular mount), Advantage: Autofire, Drawback: MPR (heavy and cumbersome – cutting movement speed by 1 – unless your STR is 2+ APs above Rec. STR), Note: Multiple ammunition belts can be chained to provide more Ammunition as needed. Offensive Grenade (x2) [BODY 01, EV 07 (Area of Effect 1 AP), R#03, Grenade drawback]. Helper(s): Sébastien Andrivet & Firebomb’s original Roadblock write-up.